Bromsgrove artist Richard McIlwraith is thrilled by the talent of local embroiderers. 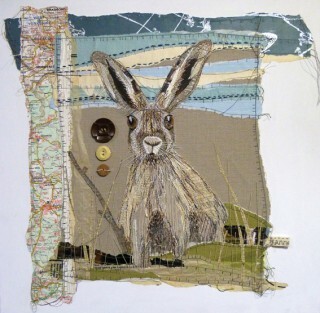 You simply must visit Artrix in October and see the staggering textile artistry on the art centre’s white walls in this touring exhibition by the Embroiderers’ Guild. Each of the 120+ pieces take a book as inspiration. The display is named “Page 17” and may just leave you speechless. Viewing the combination of painstaking work and rich imagination is an intense experience, heightened by the knowledge that the creators range from experts to gifted novices. Curators Amanda Smith and Alex Messenger created this overwhelming display to raise the profile of textile and stitched art. Traditional hand stitching and contemporary machine work intertwine and dance as you move through the exhibition. Amanda and Alex asked me to stress that this is the final opportunity to experience the exhibition; following a remarkable year, the tour of the UK comes sadly to an end. Words to artistry and back to words: A review in prose seems inadequate. Having spent the best half-hour of my week soaking in this exhibition, something deeper, more elemental, more creative is the only response that feels appropriate. Enigmatic art in thread and cloth. Thread and cloth, embellished, embossed. Wire and foil, fabric stain. A library of toil; white walls filled. Visit http://www.embroiderersguild.com to find out more about the Guild and your nearest branch. The Artrix exhibition runs until Sunday November 4 at the following times: weekdays 9am to 2pm; Saturdays 10am to 2pm; and on performance evenings. Don’t forget there is a café too! Artrix is located on Slideslow Drive, Bromsgrove, B60 1GN.